State of ERRNUM after a program ends without triggering an error. An incorrect number of arguments was passed to a function. Sometimes used instead of Type mismatch or Out of range. Tried to divide by 0 while code is running or during pre-compilation. When passing arguments of the wrong type to a function. Trying to assign a value to an integer that is too big. A value passed to a function is outside the expected range. Not enough unused memory to create/resize a variable. Tried to read DATA when there is none left. Tried to GOTO or GOSUB to a label that doesn't exist. A variable was used before it was defined with VAR or DIM (or as the input/output to a function). Only happens in STRICT mode. Tried to CALL a function that doesn't exist. There are multiple labels with the same name. 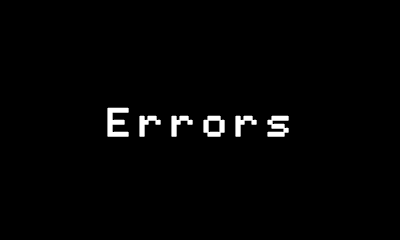 Tried to VAR/DIM a variable that already exists. Tried to DEFine a function when one already exists with the same name. Note: Within IF statements, NEXT is treated as CONTINUE and won't trigger this error. Tried to access an array/string element that doesn't exist. DEF was used inside a function definition. Tried to use CONT in direct mode after an error. Passed a string to GOTO/GOSUB that is not a valid label. Tried to use MICSTART while MIC was turned off. Tried to use ACCEL, GRYOV, GYROA, or GYROSYNC with MOTION turned off. A string that is too long was passed to a function. MPSEND was used too many times in "a short period". Tried to use a feature in direct mode that isn't allowed. These are XSCREEN 4, USE, EXEC, DEF, RESTORE, DATA, and READ. Tried to use a feature in a program that isn't allowed. Only triggered by PROJECT. Tried to USE or EXEC a file that doesn't exist. Tried to set a variable to an undefined value. Tried to use a DLC command without purchasing the DLC. Use a WII U exclusive feature on the 3DS version or vice-versa. Array saved with SAVE is too large.